LET CALTON CABINET HELP YOU CREATE A CUSTOMIZED SPACE THAT IS CRAFTED TO MEET YOUR UNIQUE NEEDS AND PERSONAL STYLE. KITCHEN: Create a high-end look without the high-end price. 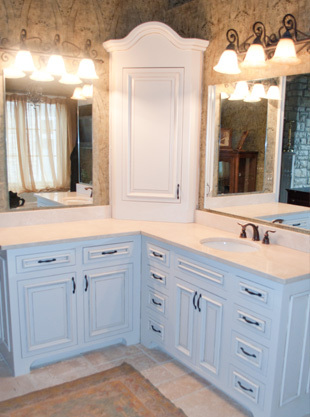 BATHROOM: Stylish solutions to maximize small spaces. 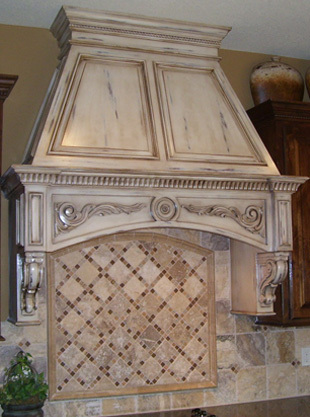 KITCHEN: A custom hood acts as a focal point in the heart of the home. 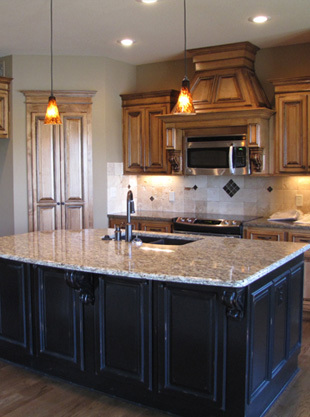 Since 1993, we have built our reputation on providing exceptional custom cabinetry and stellar customer service. As we grow, we continue to expand and upgrade our facilities in order to maintain the highest standards in construction, manufacturing and efficiency. Such improvements allow us to provide our customers with quality, custom work at a reasonable price. Many people are surprised to learn that custom cabinetry can be less expensive than units from discount home improvement centers. Unlike with “pre-fab” pieces, we let you choose every detail from start to finish. When comparing bids, make sure that countertops, hardware, installation and crown molding are included, that countertops are one piece and details like hidden hinges come standard. You’ll find that no one can compete with the level of customization we offer while keeping within budget. Working with a set of plans you have created, or measurements taken on-site by one of our trained, experienced professionals, we will prepare a free estimate for your project. Your formal, written bid will include everything required to bring your vision to life: cabinets, countertops, hardware, trim and installation.